Yoga classes are among the most popular ones offered at the Fitness Center. The Fitness Center offers six classes a day, Monday through Thursday. 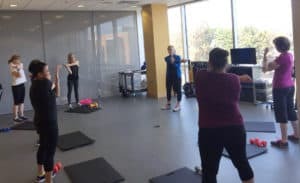 Jan. 22, 2019 | The UAMS Fitness Center expanded its class offerings in December. Now members can attend early-morning, lunch or afternoon classes — a flexible schedule that is making many UAMS employees happy. The Fitness Center offers six classes a day, Monday through Thursday, in the new studio located in Room 2202 in the Daniel W. Rahn Interprofessional Education Building. Hour-long classes are offered at 6 a.m., 4:30 p.m. and 5:30 p.m. Thirty-minute classes are offered at 11 a.m., 11:30 a.m. and noon. Click here for a full class schedule. Fitness Center members participate in a total body training class. Offerings include Yoga, Barre, Zumba and the 30-minute core and AGL (abs, glutes and legs) classes that target a specific part of the body. 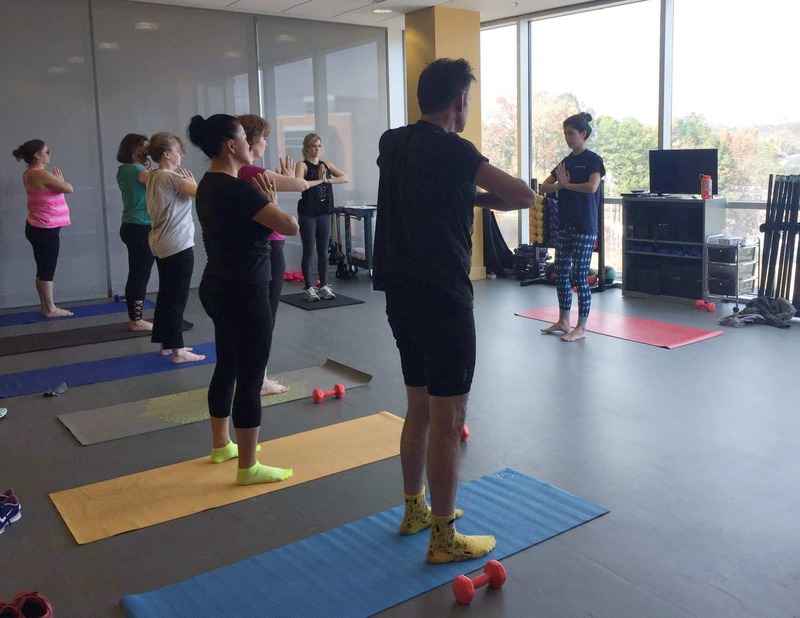 “Both the Yoga and Barre classes are proving to be the most popular,” Carter said. Summer Mote, education assistant director of academic services, has been attending the Yoga and Barre classes once or twice a week since they started in December. Mote, who has been a member of the Fitness Center since 2010, said she appreciates having access to the classes. The Yoga classes, in particular, force her to move her body and stretch, which is helpful during her third trimester of pregnancy. Both Kelly Gardner and Nikki Courtney are new Fitness Center members who joined so that they could take advantage of the classes. Courtney likes the total body training classes, while Gardner is a fan of Yoga and Barre, especially the lunchtime Yoga classes. For Courtney, the fast-paced nature of the classes is part of what appeals to her. “Working out in class settings makes the workouts go by more quickly and easily,” she said. Gardner finds that a mid-day workout improves her entire day.